Are you stressed out because you never get a chance to exercise. These stress balls make a great workout for your hands and will make you feel a whole lot better. Use them at work, at school, at college, in the car when you are stopped at the traffic light, or while walking the dog, They are fun and ideal to take along with you wherever you go. They are the ideal way to relieve stress and tension, before you get on with the task at hand. Branding your company logo onto stress balls offers a great opportunity to get your business noticed in many different sectors. They will find their way into homes and offices around the country. Our ball is made from a soft material that retains its shape no matter how hard it is twisted or squeezed. 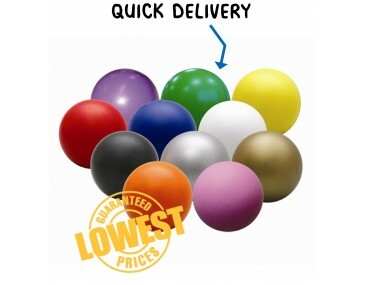 The balls make fabulous fun freebies at trade shows, outdoor events, expos and corporate occasions. Everyone loves a stress ball and people will be lining up to get hold of one from your stall. Talk to us about branding your image onto the balls, our listed price includes branding of your logo or graphic in a single colour print. We offer a product turnaround time of two weeks, but we can offer even faster turnaround times for urgent orders.